Yoga, with its emphasis on unity and balance, invites harmony into the body and mind, and supports expectant mothers as they adjust to the constant physical and emotional demands of pregnancy, birth and motherhood. Prenatal yoga classes include instruction, emotional support and the community of other mothers to be. The amount of support a woman receives during pregnancy is considered vital for overall health of the mother and baby. Prenatal yoga classes allow women to share their experiences in a safe and supportive environment providing a sense of community and friendship. stretches and exercises designed to relax and rejuvenate the body, calm the mind, and help alleviate common discomforts of pregnancy( sciatica, back pain water retention, digestive difficulties, insomnia etc.). helpful positions for labor and delivery to facilitate an easier (and less painful) birth. breathing and relaxation techniques designed to calm and focus the mind, allowing expectant mothers a chance to connect with their growing baby and form a loving bond even before birth. Its an opportunity to unwind and leave feeling refreshed. Improve strength, flexibility and endurance in all the muscles and surrounding tissues which promotes blood circulation and prepares expectant mothers for the physical demands of labor and childbirth. Reduce swelling and joint inflammation which are caused by water retention and poor circulation. Yoga promotes circulation and is effective at preventing and reducing swelling around the ankles, feet and hands. Prevent and alleviate back pain and sciatica by maintaining proper posture. Yoga teaches you how to become aware of proper body alignment. . This can help reduce he degree of pelvic tilt associated with pregnancy and can significantly reduce lower back pain and sciatica. Additionally, there are specific yoga postures that stretch the muscles in the hips and hamstrings, which if tight, can place strain on the lower back. Create optimal health, well-being and confidence. The physical, emotional as well as spiritual components of yoga can help reduce pregnancy related anxiety allowing expectant mothers to experience the miracle of childbirth and empowerment of pregnancy. Aids in digestion. As your baby grows, the intestinal tract gets pushed around which may affect your regularity and cause indigestion. 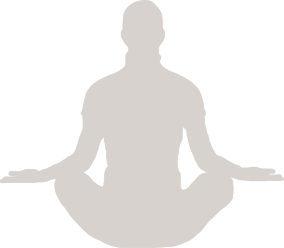 Certain yoga postures can help promote regularity and aid in overall digestive flow. Babies benefit from Yoga! During yoga, babies receive increased oxygen and endorphins. The movement of yoga postures also gently massages the baby and creates an inner memory of relaxation. Babies will carry this within them for the rest of their lives! Reduce fear and anxiety. Fear and anxiety cause the secretion of adrenaline and this causes constriction in the muscles, tiring the body. Yoga helps decrease adrenaline and increases endorphins, the body’s natural painkillers. In “early labor”, practicing simple relaxing postures can help reduce fear and anxiety. During Labor, women who practice yoga are more likely to feel comfortable changing positions which can help with “stalled labor” or plateaus. Certain postures in particular like squatting and child’s pose help tremendously as the baby descends through the birth canal. "I had a healthy baby boy on November 21st at 7:45am. He was 11 days overdue and I did everything I could to prevent them from inducing me. Time was ticking, so by the tenth day, I had enough and decided to go to the gym (which I had been going up to the 37th week) and do 20 minutes of stairmaster. Well, a few hours later , the contractions started at midnight. I was mentally preparing for a 24 hour labour and my plan was to have a natural birth thus wanting to stay at home for as long as possible before going to the hospital. On the onset of the contraction, I remembered what you always told us during the pre-natal class, to relax and trust your body will know what to do. I repeated your words in my head several times through the next few hours. I tried to relax by using incent and moving around (going for walks in my hallway) throughout the contractions. I also did the voices and this helped. Three hours into my labour my husband, who was timing my contractions, told me we should go to the hospital. I said, it's too soon but by this time my contractions were 3 minutes apart! By 4:30am, I was admitted at Saint Mary's hospital at 4cm dilated. By 6am, the pain was becoming unbearable and I was using my voice so the whole hospital could hear it. I was considering drugs at this point as I could not do several more hours of this but when the nurse checked, I was already at 9 cm dilated and it was soon time to push. I said to myself at that point, I am in the home stretch and it's going fast. After an hour of pushing, I heard my baby's cry for the first time and discovered it was a boy. My husband and I are overjoyed at how everything went well (and quickly) and as we had planned (natural birth) and I have no doubt the pre-natal yoga class had something to do with it. I did 'let go' of my fears and stress in body throughout the labour, as you had taught us, and I believe this helped the labour move quickly. You were with me Elyse in spirit throughout this experience, giving me the confidence to trust my body and I am grateful to have been able to benefit from your gift." Use the muscles of the pelvic floor effectively. Squatting combined with kegel exercises during pregnancy can greatly help with your labor. If you are used to working with these muscles, you will find it easier to use them quickly and effectively when it comes time to push. Toning the muscles of the pelvic floor also lessens the chances of tearing, and if there is some tearing, healing will be enhanced. About the Prenatal Yoga teacher. Elyse Tannenbaum (B.A., B.S.W. RYT.) is a certified Prenatal Yoga Instructor who has been teaching since 2003. She has had the privelege of working with several thousand expectant moms and new mothers, and has witnessed the beneficial effects of yoga experienced by women during this time of transition. Elyse is captivated by all the potential of the human body particularly in the realm of pregnancy and birth, and continues to deepen her focus as a specialist in pre and postnatal care. She is also a Registered Pregnancy Massage Therapist, Postnatal/Mom and Baby Yoga Teacher, Infant Massage Instructor, and has recently trained as a Doula to assist women during labor and the birth process. A former social worker, Elyse brings enormous empathy and knowledge to her work with both expectant and new mothers. She has made it her mission to help women see their intrinsic beauty and to honor their bodies at these times of both incredible wonder and equally incredible stress. Why Mom and Baby Yoga? Congratulations on becoming a new parent! Just as pregnancy is a time of transformation, so is the postnatal period.. If you’ve had your baby, you’ll be adjusting to the new role as a mother. How can mothers transition from expecting a child to a balanced life with baby and family while their minds and bodies are affected by hormonal changes, lack of sleep, and physical strain? Postnatal Mom and Baby Yoga is a great way to start! Mom and Baby yoga is a gentle way to help your body recover from childbirth while bonding and having fun with your baby. It is also an opportunity to connect with other mothers and share the experience and insights of raising a child. In these baby friendly cases, special attention is placed on rebuilding core strength of the back, abdomen, and pelvic floor, as well as relieving tension in the neck, and shoulders caused by/due to lifting, carrying and nursing. No previous yoga experience is required. What Do the Babies Do? During the class, you are guided through a series of modified yoga poses, either holding your baby in your arms, leaning against your thighs, atop your belly, or resting by your side on a blanket. The babies also receive /enjoy a gentle baby yoga and massage session, allowing them to stay flexible, sleep easier, in addition/as well as relieving common discomforts such as gas, colic and constipation. The structure of the class varies each week to accommodate the need of the mothers and children present that day. Some weeks, the moms need lots of shoulder and upper back stretches, while other weeks may focus on strengthening the abdominals, and lower back. Everyone is encouraged to move at their own pace as classes are suitable for beginners as well as experienced yoga students. What Will Mom and Baby Yoga Do For Me? - When Can I Start? Staying home for a minimum of 4 weeks is optimum to foster the mother/baby relationship, get breastfeeding off to a good start, and allow your body to recover from pregnancy and birth. 4-6 weeks is a good time to wait before attending class. If you had a C- section, this time should be extended to about 8 weeks, or until you receive the go ahead from your doctor. The age range for babies are newborn to crawling which is around 7-10 months for most babies. You can join a class at anytime as movements are simple and easy to learn. Go to the Classes page for the schedule and visit the pricing section for rates and information on how to register. Becoming increasingly popular, Infant Massage is taught by certified instructors to new mothers as a way of promoting strong nurturing bonds with their newborns. Encouraging infant health, Infant Massage incorporates nurturing touch, massage, and Reflexology in a fun, one-on-one interaction. This is a way of conveying love, an essential ingredient for emotional and physical well-being. Infant massage can help improve circulation in newborns and relieve some common ailments such as gas and colic. Studies performed at the University of Miami on premature infants prove that massage can result in significant weight gain and developmental improvements. Helps relieve chest congestion – some strokes help the immune system fight infection while others loosen phlegm and drain the lungs. Empowers parents – parents feel they are taking an active role in understanding their baby better and relieving his or her discomfort. To help your baby grow and develop in such a positive way is rewarding for any parent! 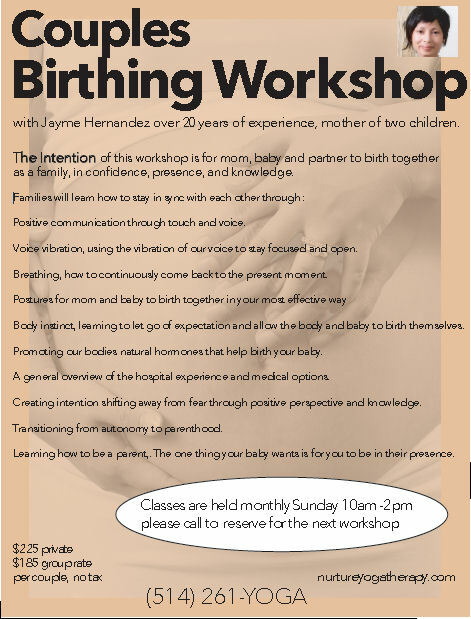 The intention of this workshop is for mom and partner to birth together as a family in confidence, presence, and knowledge. Families will learn how to stay in synch with each other though. Positive communication though tough and voice. Voice vibration, using the vibration of our voice to stay focused and open. Breathing, how to continuously come back to the present moment. Postures for mom and baby to birth together in your most effective way. Body instinct, learning to let go of expectation and allow the body and baby to birth themselves. Promoting our bodies natural hormones that help birth your baby. A general overview of the hospital experience and medical options. Creating intention shifting away from fear through positive perspective and knowledge. Transitioning from autonomy to parenthood. Learning how to be a parent, the one thing your baby wants is for you to be in their presence.